When I look back at the Halloweens of my childhood, I’d have to admit that the candy was my favorite part. Costumes and decorations came in a close second, but I can’t deny that I had (and still have) a crazy sweet tooth. 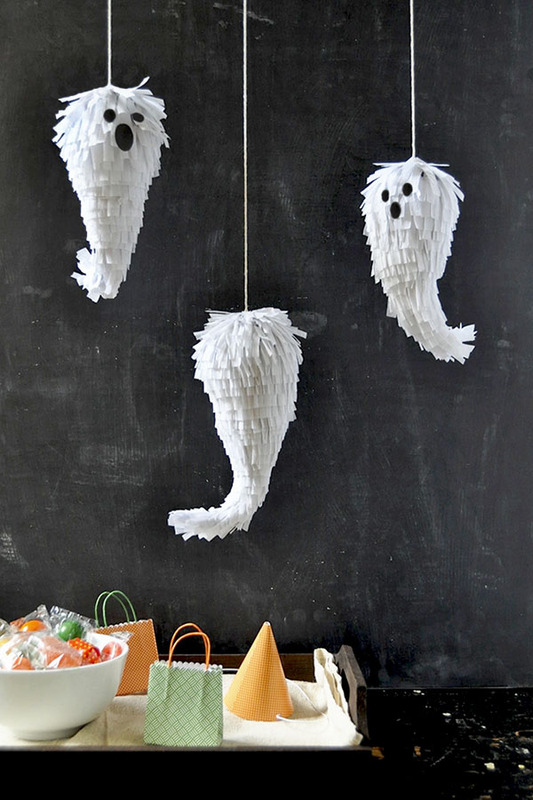 With that in mind, I’m always looking for fun ways to add more candy to the Halloween festivities, and what better way to do that than with these mini ghost piñatas? 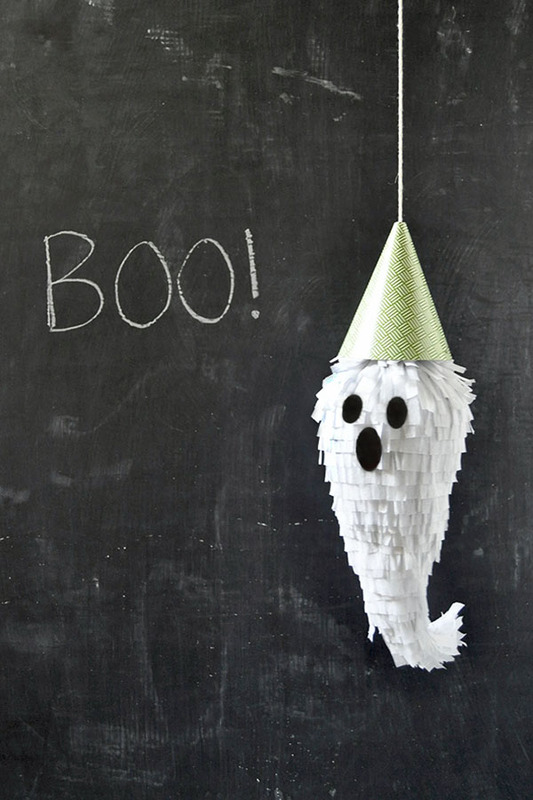 Adorable hung in groups or individually, you could even hand these out as loot bags for your Halloween party this year! Step 1: Blow up balloons to desired size. Step 2: Mix some white glue with water and tear up the newspaper into small pieces. 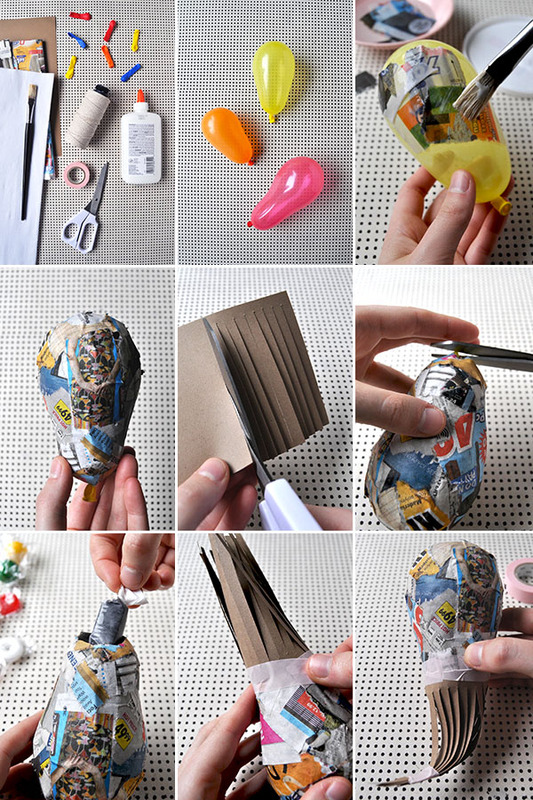 Paper mache the balloons. Step 3: Let dry completely. Be sure the paper mache is strong and doesn’t cave in when you hold it; two layers might be necessary. Step 4: Take a 5″ by 8″ piece of card stock and cut it into a fringe along one side. This will be the ghost’s tail. Step 5: Cut the balloon out of the shell and cut a hole big enough to fit the candy you’ll be putting inside. Step 6: Fill the piñata with candy! 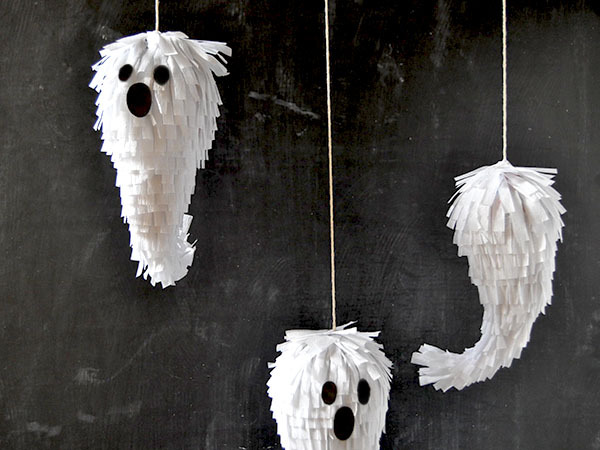 If you want to just use the ghosts as decor instead of piñatas, you can skip this step. Step 7: Wrap the fringed card stock around the piñata and use washi tape to secure it. Cut off any of the card stock that overlaps onto itself. Step 8: Gather the fringe together and tape the ends together so that it forms a curled tail shape. 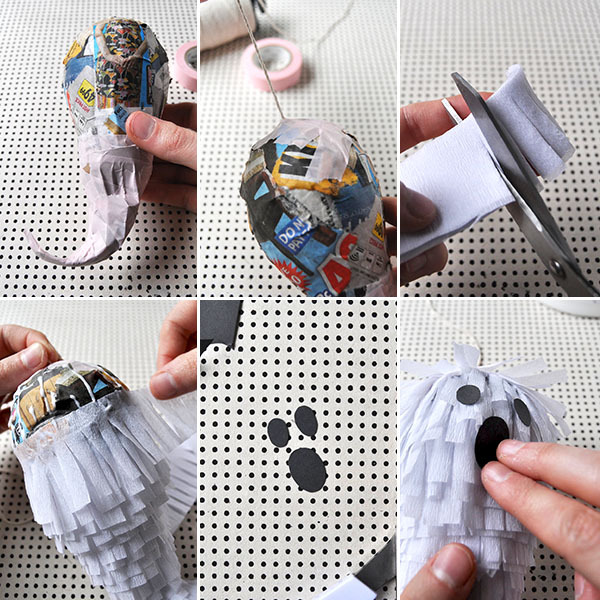 Step 9: Cover the tail in washi tape – don’t use too much or the piñata will be too difficult to break! Step 10: Tape a string to the top of the piñata. Step 11: Cut the white crepe paper into fringe. Step 12: Glue the fringe onto the piñata, covering the entire surface. Step 13: Cut eyes and a mouth out of black card stock. Step 14: Glue the eyes and mouth onto the piñata. Awesome idea! So fun. I’m not big into Halloween but I know once my baby is born I’ll have more of a reason to celebrate! Cause holidays are so much more fun with kiddos. 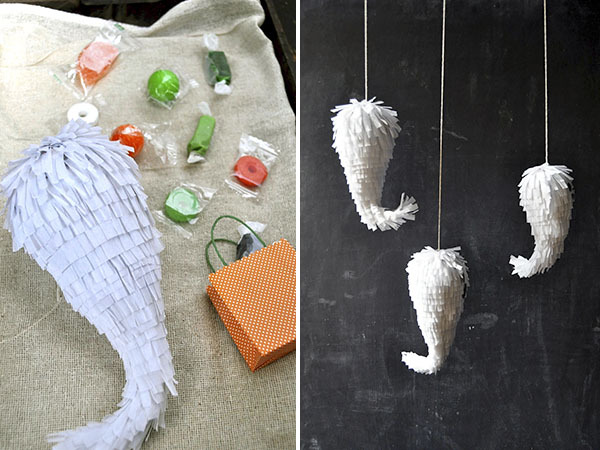 These pinatas are too cute to smash!! Thank you also for this idea! I write a post about your Halloween kids costumes! They are amazing!